Being a Hebrew-Latin interlinear version, this Bible has an interesting dilemma. Latin, like English today, reads from left-to-right. However, the Hebrew language is opposite, reading right-to-left. This Bible had lines of Latin translation between the lines of Hebrew text. Now since each language reads in a different direction, if we are going to intermingle lines of Hebrew and Latin, one of them has to read backwards. In this case the Hebrew is the primary text, so the Latin is reversed. The small numbers on the left edge are verse numbers. By placing them in the center of the page, they did not interfere with the Marginal Notes. 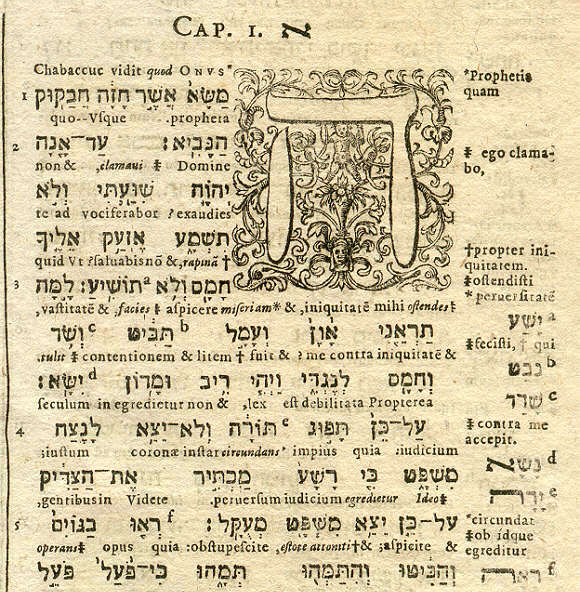 Christopher Plantin, the publisher of this Bible, was known for his development of a Hebrew alphabet suitable for printing. The fine lettering, along with the outstanding woodcut of the Hebrew letter "He", are excellent examples of his work.